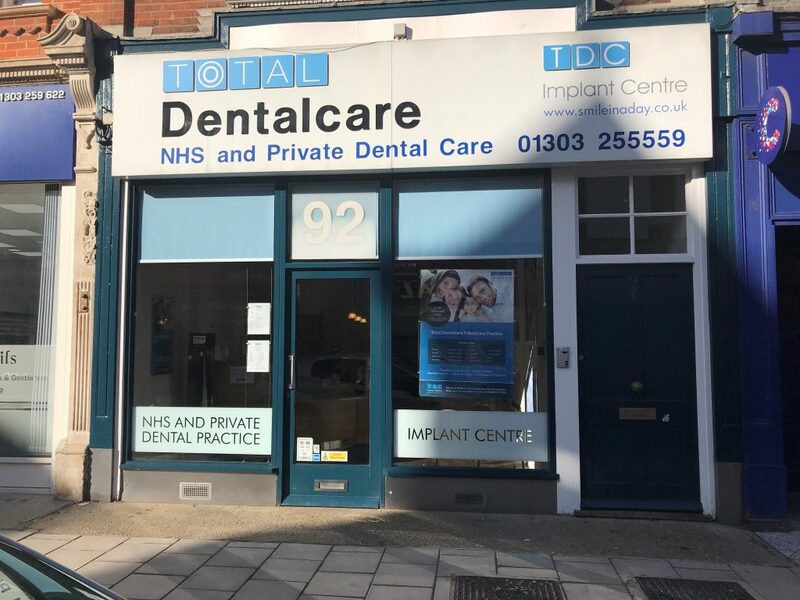 Conveniently located on Sandgate Road, Total Dentalcare Folkestone offers both NHS and private dental care for the whole family. We offer a wide range of general dental treatments including check-ups, fillings, crowns, root canal treatment, dental bridge-work, tooth whitening and smile-makeovers. Our dedicated TDC Implant Centre is located at the same address and is a centre of excellence for same day dental implants. We are leaders in the TDC Smile in a Day same-day implant procedure (sometimes known as All on Four or Teeth in a Day) and are proud to have transformed the lives of hundreds of patients who can now smile again with confidence and eat without worry. Our practice now offers extended opening hours. We open at 8:30am from Monday to Thursday, and at 8.00am on Friday. We offer appointments until 8:00pm every Tuesday, Thursday and Friday evening. The practice is open every Saturday and Sunday from 8:00am until 8:00pm. We are closed on Bank Holidays. We are currently accepting both new NHS and private patients – NHS places are limited, so please register by March 31st to secure your place. "This was my best experience ever in a dentist’s chair and I would recommend to all who may like me be a little nervous to book into this surgery. I will certainly not be nervous on my next visit. All staff from receptionists to dental nurses are fab." "Had an emergency yesterday. Dentist was so nice. Receptionist very compassionate and understanding. THANK YOU." "I highly recommend this practice, only wish I had found it years ago." "Two visits over Christmas (one emergency, seen within hours)." "Reception girls friendly and helpful. Dentists very considerate and involve you in all treatment decisions. Surgery spotless and on-time appointments." "I cannot praise this practice more highly. Having suffered many money-oriented not really bothered practices in the past, it is a relief to find one that is so different." By car – We have limited street parking outside but Council-run car parks are available close by. Please put CT20 2BE into your Satnav. By rail – We are approximately 8 minutes walk from Folkestone Central train station.